This is a multi-armed form, sometimes also called "Fukukensaku," of eleven-headed Juichimen. The scale of this 17-foot high statue can be seen by comparison with the photographer at the far left. 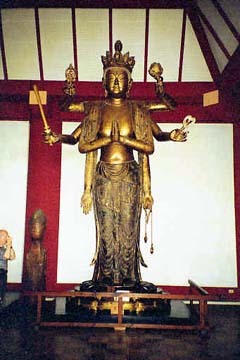 The statue was made in 1222 as a replacement for an early Nara piece. Stylistically, the facial expression suffers from a kind of formalism (or "by-the-book" carving) that often mars Kamakura-period imitations of older styles. This can be seen by comparing the two faces above. The first is a closeup of the present statue, and the second is from a Heian-period Juichimen Kannon. Although the schematic treatment of the present statue's facial features tends to distance the viewer, it is a valuable example in and of itself.